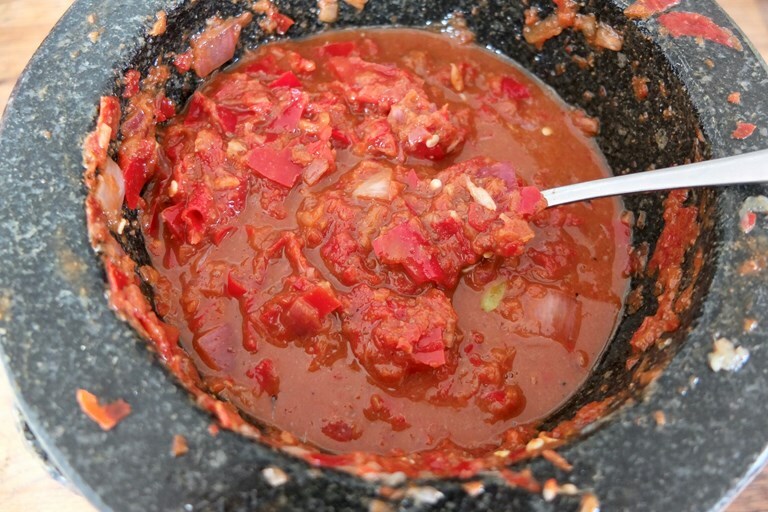 This sambal recipe is a Malaysian chilli sauce flavoured with belacan, a type of shrimp paste full of umami and depth. Fantastic spooned over all manner of Malay and Singaporean dishes. Take a look at all of Helen's hot sauce recipes here. Sambal is native to the cuisines of Indonesia and is popular throughout Malaysia, Singapore, Sri Lanka and Brunei. This Malaysian-style sambal belacan is made with shrimp paste and at its most simple contains just three ingredients – chillies, shrimp paste and lime juice. Other ingredients can then be added to personalise the mixture as I’ve done here. The shrimp paste has been produced by salting, drying and fermenting shrimp which makes for a very funky smelling brick of umami. Once toasted and mixed with other ingredients, however, it brings fantastic savoury depth to the sauce and plays well off the sourness and heat to balance everything. It’s an essential accompaniment to many Malaysian meals. This recipe makes approximately 600ml of sauce.